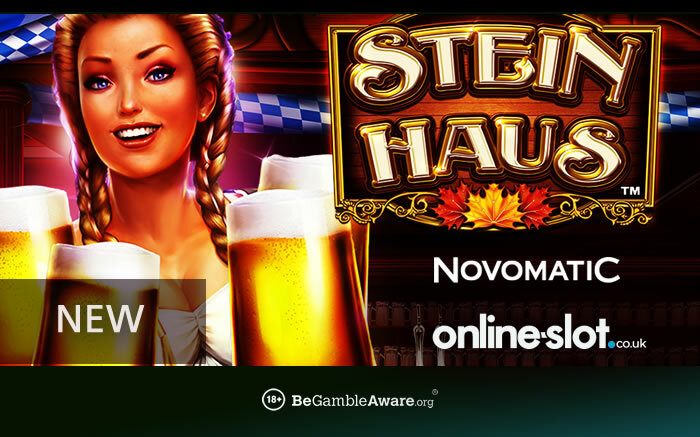 Head to a Bavarian beer tent with Stein Haus, the latest slot from Novomatic, where you win up to 1,000 times your stake on each free spin. Stein Haus has just been released and allows you to experience Oktoberfest without having to visit Germany – with 5 reels and 50 paylines, you can play this slot from as little as 50p a spin on desktop (laptop/PC), smartphone and tablet devices (including iOS and Android). With weisswurst sausages, beer barrels and lederhosen cladded characters, this game is all about the Stein Haus bonus symbol as it’s the scatter – 3 or more will trigger the Free Games with Moving Wilds feature. If you get 5, you’ll also pocket a 200 times stake payout. Anyway, you will receive 10 free spins – the triggering scatters transform into large Wild Stein symbols that take up 2 positions on the reels. These move with each free spin giving you plenty of opportunities to win big – if you manage to fill the reels with wilds, you’ll win 1,000 times your stake! You can play Stein Haus right now – the first option is LeoVegas Casino who have over 1,000 slots and welcome new UK players with 20 no deposit spins on Play ‘N Go’s Book of Dead. On your 1st deposit, you’ll get a 100% match bonus up to £300 plus 30 more Book of Dead spins. The second option is Videoslots Casino who have an undisputed 2,700 slots! With games from all software providers you can think of, sign up and deposit to get a 100% first deposit bonus up to £200 – you will also then get 11 wager-free welcome spins on NetEnt’s Starburst plus £10 cash extra free.